In November last year, I wrote about my first-ever visit to the local auction house. It was a serendipitous visit, as I explained back then, which resulted in me owning the much-coveted, but long-out-of-print “Richard Schmid Paints Landscapes” book. I also mentioned that I missed out on some Walter T. Foster art instruction books that were on offer in the same auction. They went with an opening bid of $30, which was more than I was prepared to pay for them that day (as I had already bought a couple of things and was yet to find out how much the Schmid book might cost me). I grew up with Walter Foster books. My family had four or five of them covering a range of subjects from cartoons to animals to general drawing instruction. To this day, I can’t walk past a Walter Foster book without flicking through it, although I don’t see them all that often. I’ve bought a few over the years if the subject matter was relevant to me. I have visited the auction house every week since my first visit in the hope of a repeat performance, but pickings have been thin, until this week. Yesterday, I waited patiently for three hours as the auctioneers worked their way through the list of items from lawn mowers, to diesel engines, to lumber, furniture, crockery and, finally, to a small stack of Walter T. Foster art instruction books. Again I readied myself for the bidding battle to end all battles. The auctioneer started at “Thirty Dollars?”, “Twenty?”, “Ten? Okay next item”. I raised my hand and cheekily offered five dollars for the books. Bummer, someone else wanted them after all. I nodded to ten dollars and resigned myself to paying more. I’d expected to pay anywhere up to $30 anyway, so I was ready for this. But it was over. No more counter offers. 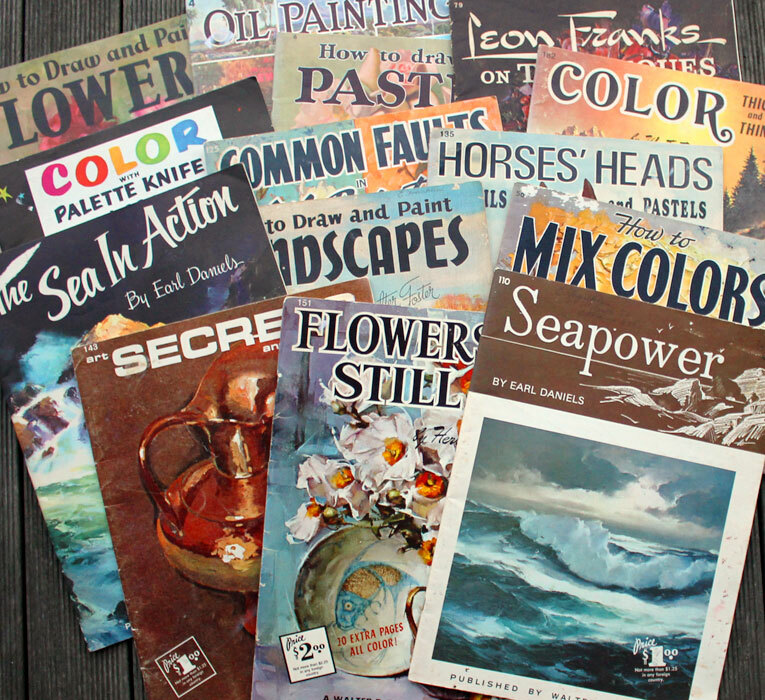 A nod at ten dollars, and 14 Walter Foster books, including seascape and still life titles, were mine. I just discovered the Walter Foster publishing company, founded in 1922, has a website and is still producing instruction books.